Cross platform digital intermediates for independent filmmakers. There's a serious issue that I"ve run into with Cineforms HDLink utility. It's become apparent that this has been around since the previous iterations of Neoscene I was working with, but didn't realize til this weekend of the severity of the issue. The utility appears to be causing frame drift/dropping frames during the encode. I have tested and confirmed that it is the utility itself as I was able to drop an m2t file on the Vegas timeline and render out a perfect length CF AVI. I also confirmed that Canopus as well as an issue with their encoder, but not as severe. I rendered an AVID DNxHD clip via MPEG Stream Clip and found it to be flawless in it's encode. Same number of frames as the original and exact same length of time. As of this time, I can't trust using Cineform's HDLink utility as it stands now - the picture below shows the discrepancy compared to the original and the same clip encoded to AVID's DNxHD. I have opened a tech support ticket with Cineform and hope to hear back from them as soon as possible to resolve this unsettling issue (I was going to use Cineform for a current post production project I have - I now have to consider AVID's DNxHD). I have confirmed that there is a synch issue with HDLink. I have reproduced the issue several times today. Since the audio and video are out of synch, this precludes Cineform from any post work for me until they resolve the issue. I've also read of others who others on the dvinfo forums who have experienced the same issue so mine is not an isolated instance. We don't test with Vegas generated M2T sources, we test with camera sources (a tad more important), for HDV cameras we are in sync. I just re-confirmed with the latest build. Sync has not changed in years, and HDV support has not changed in years, it would be very unlikely that you have discovered a new bug after maybe 100,000 users have converted through HDLink. Work with support to see if your camera model is somehow less compatible than others. 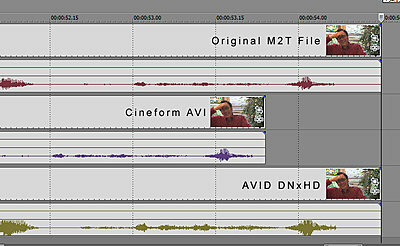 HC7 and Z7U camera generated m2t files exhibit the same frame drop - and I've confirmed this in PPro, Edius and Vegas Pro 9. Please review the image posted at the top - this was from camera generated m2t files. The media generation was to create a base to make sure it wasn't camera specific. In addition I've also downloaded AVCHD MTS clips from the net generated from other cameras and the same behavior also exists. The following do not stay in Sync: SONY NXCAM, Canon HF-S10 in addition to clips from HC7 and Z7U. It should be noted that those that do not stay in sync exhibit the same behavior with audio and video frames as the generated media test I did in Vegas Pro. Each encoded at low setting with the latest HDLINK utility for NeoScene. Explain to me why then there are inconsistencies across known camera brands and codecs? MTS, AVCHD and m2t appear to have issues with HDLINK, h264 MOV files seem not to, even though this post seems to contradict my findings on the T2i from earlier this year. Last edited by Cliff Etzel; June 28th, 2010 at 01:54 PM. While I haven't used those exact models, we do have range of Sony, Canon and JVC HDV cameras, are the audio is in sync. This is for support and is not a general issue. Maybe you PC have an usually audio component that is throwing your conversions off, support is there to help you find things like that. You also should send them an M2T sample, if it doesn't do them same for them, you will know it is system dependent. In the meantime making statements like Game Stopper is not helping anyone. I can confirm the same repeatable results after running the same test on my second computer - a Dell D620 Laptop. The original tests were conducted on a quad core desktop machine. I've posted 2 updates this morning to my tech support ticket and have yet to hear from anyone regarding this issue. As it can't be proven here, you need to work with support. One might conclude that if you've bet on Cineform as your intermediate and it's not able to keep sync or is dropping frames, it's a game stopper for that person. Certainly would be for me if I was in that position. Hopefully, support can replicate and produce a fix. I believe Cliff told me he opened a ticket over 24 hours ago with no response as of yet. That in itself is worrying. Yesterday was a Sunday, not worrying, but a day off for support. David - I apologize for coming off harsh - it wasn't directed at you personally. It's extremely frustrating to have this kind of thing arise when I have over 300GB of M2Ts staring at me and a looming deadline with a commissioned documentary project I am about to start editing. I haven't heard anything from tech support and given that combination of things, it can come across as such. Please accept my apologies if you were personally offended. So what happens if you use some other utility - say, Adobe Media Encoder - to transcode m2t's or 7D files into Cineform? Do you have perfect sync then?